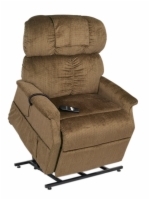 The GL-358XL is a heavy duty, 3-position lift chair that reclines to a comfortable napping position. It is padded with overstuffed-blown fiber, so it is very comfortable, and still provides plenty of support for your back. This chair has a rated weight capacity of 500 pounds. The GL-358XL is a great choice for users 5'6" up to 6'1" tall that require a wider (26"), deeper seat, with a taller backrest to give them the extra room they need to sit comfortably. 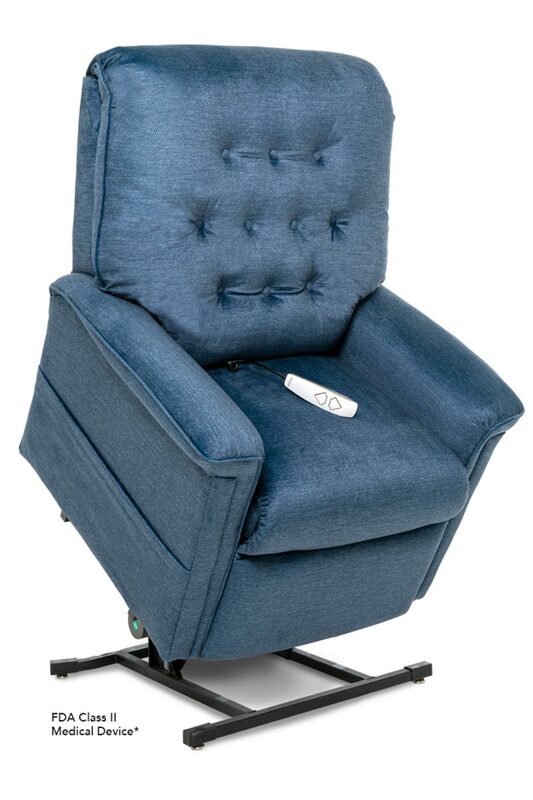 The GL-358XL standard features include armrest covers, headrest covers, 7 year warranty, emergency battery backup plus options including heat and massage, dual side pockets, and left-hand control. For People Taller Than: 5' 6"
For People Shorter Than: 6' 1"
A very disgruntled Customer named Ticked Off!!! from In my current broken down chair would not recommend this to a friend. Disabled person that was taken advantage of and lied to, with fraudulent information on this chair to get my Social Security money. Was told that delivery would be free, and inside my home as I have no stairs, elevators etc...What a joke...was told to offer the delivery guy a tip, perhaps $20.00 to take it out of the box and slip the back on the chair...The delivery guy was so rude and not only did he not deliver inside my home, he dropped it off outside and would not even move the pallet closer to the front door for my son (who has aback injury die to recent motorcycle accident) to be able to get it inside a little better...He was argumentative, bad mouthed the company and almost got into a physical altercation with my son...These people and this company are winners folks, can you tell by now? Appleanne from Farmington,Michigan would recommend this to a friend. Nice quite chair and fabric is very nice love the color. The service and delivery was great, the chair came very fast 3 days I think was sure surprised to see that it came so fast.And the salesman I had was very nice and helpful. I'm 5'6 and this chair is to tall for me. The chair is a hard chair so it takes time to get use too, I think I may have returned it but I got a really good price and was happy with that. Wayne from Chicago, IL would recommend this to a friend. This 3-position lift chair is everything that was advertised. I'm writing for my wife, who has arthritic knees and other health problems. We chose this chair over several others because it could accomodate her size. The batteries are hard to install because of the small wires, and I am afraid they will break and require servicing. Unhappy from Valdosta, Ga. would not recommend this to a friend. I purchased the liftchair thinking that some day I might really need to have an assist to stand from a sitting position. It does this fairly well. But the remainder of the features don't amount to a hill of beans. First they charge an exorbitant fee to add a vibrating/heat option. I only wanted the heat. Then come to find out that the heat only covers less then 12 Square inches next to the seat of the chair. Then to complicate things, they put a 15 minute timer on the heating pad to turn off. Thus if you sit in the chair for more than 15 minutes and want heat, you must recycle the heat switch to maintain the heat. I would like to have it for no less than one hour at a time. This would make more sense to me. I feel that this option was a waste of money. I have had the chair for about a year, and it is beginning to creek like a abused wooden chair. I truly feel that the wooden frame may be coming apart, as well. When I first set up the chair, it was placed on a hard wood floor. Then each time I sat down it would move a little. Thus when it was time to recline the chair, it would hit the wall. This required that I pull the chair away from the wall. I think that they should have put some type of feet on the unit, that would fit all types of floors, and prevent skidding on hard surfaces. It would be nice if the remote control for the chair were mounted permanently in the chair. You must search for the switches on the long cable each time you wish to make an adjustment. How nice it would be if the switches were mounted in a small box on the side of the arm rest. This could be specified as to right or left, according to the customer. It is a real hassle to find the switch each time you want to make an adjustment, turn on the chair shaker, (They won't let you use the word the properly describes this device! ), or the heating pad. I would not recommend this brand of chair or this supplier to anyone.